Britain's Prime Minister Theresa May and European Council President Donald Tusk attend a meeting at a European Union leaders summit in Brussels, Belgium October 20, 2017. 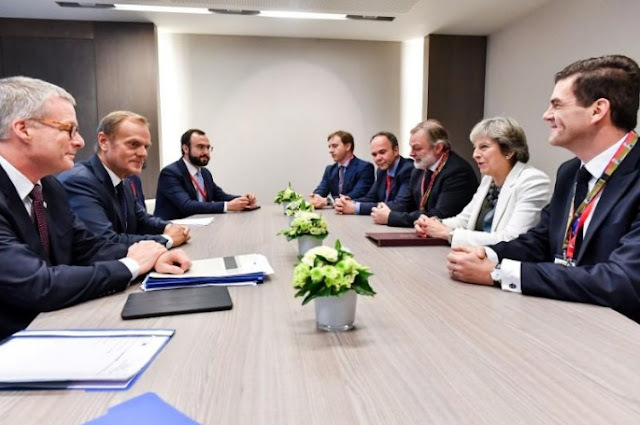 BRUSSELS - European Council President Donald Tusk said on Tuesday that it was up to Britain to determine if there was to be a good deal or no deal in Brexit talks. “We have managed to build and maintain unity among the 27, but ahead of us is still the toughest stress test. If we fail it, the negotiations will end in our defeat. We must keep our unity regardless of the direction of the talks. The EU will be able to rise to every scenario as long as we are not divided,” Tusk, who chairs summits of EU leaders, told the European Parliament. “It is in fact up to London how this will end, with a good deal, no deal or no Brexit but in each of these scenarios we will protect our common interests only by being together,” he said. European Council President Donald Tusk said on Tuesday that it was up to Britain to determine if there was to be a good deal or no deal in Brexit talks. “We have managed to build and maintain unity among the 27, but ahead of us is still the toughest stress test. If we fail it, the negotiations will end in our defeat. We must keep our unity regardless of the direction of the talks. The EU will be able to rise to every scenario as long as we are not divided,” Tusk, who chairs summits of EU leaders, told the European Parliament.